The house of your dreams! Land of almost 1. 000 m2, beautiful pool, novissima churraqueira and ultra modern pizza oven. The house sleeps 14 guests in 5 cozy suites with air cond Split brand new. and bathrooms w / central heating. Mezzanine deck w / watch LCD TV 48 INCHES w / air cond., Game table. visit and dining room, listening to sound in 3 environments and still enjoying the beautiful view w / the whole garden in the reserve of the Atlantic. Kitchen and service area very complete w / all appliances p / serve guests in quantity and quality. Meanwhile, his two cars are in the garage, plus the other 2 in the discovery, along with the wonderful spring to. To ensure the visual, we gardener / swimming pool builder. Best of all, to complete the stewardship, we have FAXINEIRA / COZINHEIRA for the domestic tasks, whose hiring and adjustment must be done directly with her. ALEM OF DELICIOUS FAIRS, CAN ALSO BE USED FOR THE MARRIAGE OF YOUR DREAMS. My wife and I, together with our friends from Germany were looking forward to a great vacation, joining our Brasilian friends in Sao Lourenco, Brazil. The reservation was time consuming after many phone calls and e-mails and we made the payment. We booked the house for 4 Nights and it was agreed with the owner that we could enter the house at 10 am. But despite the agreement with the owner the prior tenants where still asleep by 10:30am when we arrive. We finally entered the house around 7 pm. Even though it was a bit dark, we all were shocked by the state of the house. It was dirty, there was stains on the floor, on the sofa and chairs, beds and on the bedsheets, the towels were dirty, the showers still had hairs and dental floss (?) from the former tenants. The kitchen was a desaster with unusable pots and dishes, the coffee maker still had the coffee inside with mildew (disgusting!) and some electrical appliances were -in our opinion- a safety hazard to the people since the wallplugs were lose. The fridges were dirty and had dead insects. Other appliances were in a bad shape, dirty and not usuable. The garden still carried ballons, cigarette stubs, trash, crown caps and empty bottles from former party. Some flags around the pool were lose when you step on these, thus a further hazard. We made over 50 pictures to document and support my comments. In short, it is our opinion that the pictures on the internet were made many years ago and do not correspond to the actual state of the house. Our opinion is that cleanliness and safety are below any standard, it is a filthy place. We decided to leave the house at once, but could not find a hotel close by, so we spend the night sitting on a bed, afraid of lying down due to dirty bed sheets. On the next morning we and our Brazilian friends (language issue) informed the owner about the state of the house, moved out of the place and rented another appartment nearby our friends. The owner admitted that it was a long time since she has been in the house, and we agreed that we would pay one night only. She was understanding and asked for the bank account where to transfer the money. The next day our Brazilian friends forwarded all the information to her. Since that time, no answer to our phone calls, and of course no reimbursement! De início informo que a distância até o mar não são 150 metros como descrito e sim 500 metros, medidos com programa (são 3 quadras) não mais que isso. Outros detalhes do anúncio deveriam ser atualizados, ou apagados, como por exemplo televisores nos quartos e ar condicionado no mezanino, pois não possuem. Outras informações também deveriam ser mais detalhadas, como por exemplo o tamanho das camas em cada suíte, se são padrão, queen ou king size, isso ajudaria na hora de levar as roupas corretas. Percebemos em vários ambientes a falta de lâmpadas, ou com mal funcionamento, o lindo jardim por exemplo com 1 apenas funcionando. Outro detalhe são que várias torneiras estão girando em falso e não abrem, assim como os banheiros do piso superior, quando utilizados juntamente, a água está voltando pelos ralos, as duchas são excelente, com muita pressão e esquentam bastante. Caberiam manutenções pontuais para deixar tudo em ordem. A casa é muito aconchegante, com os ambientes todos integrados, a piscina é cristalina, limpa todos os dias. Recomendamos também a contratação da caseira Andreza, discreta, atenciosa, cozinha muito bem, vale à pena este conforto a mais. OBRIGADA POR SUA AVALIAÇÃO MAS, ELAS SÃO POUCO VERDADEIRAS. 1. A CASA DISTA UMA QUADRA E MEIA DA PRAIA E NÃO TRES. 3. TAMANHO DE CAMAS NÃO FOI SOLICITADA. 5. NÃO EXISTE NENHMA INFORMAÇÃO ENGANOSA. A Casa é maravilhosa, muito bem cuidada e confortável, tivemos uma ótima experiência e certamente voltaremos em outras oportunidades, a proprietária é muito atenciosa e a diarista um amor de pessoa, muito prestativa e educada. Fico realizada quando meus inquilinos se sentem felizes e confortáveis . Voltem sempre é muito obrigada . Excelente casa, com certeza voltaremos sempre. A proprietária me passou muita tranquilidade! Tem tudo que promete, minha familia e eu aproveitamos muito. Parabéns pela casa, passamos um fim de semana maravilhoso|! casa muito arejada, com todos os utensílios de cozinha, camas confortáveis e contato incrível com a natureza! Decoração impecável. PS: Suas orquídeas estão lindas! Até a próxima! MUITO OBRIGADA POR SUA AVALIAÇÃO. EU REALMENTE TENHO PREOCUPAÇÃO EXTREMA EM MANTER A CASA SEMPRE LIMP, CONFORTÁVEL E BONITA. SERA UM PRAZER RECEBE-LOS SEMPRE. DEIXARAM A CASA IMPECÁVEL. A casa é ótima, a proprietária é muito educada e gentil e passamos dias ótimos nessa casa. Super indico! EU PROCURO CUIDAR DA CASA COM MUITO CUIDADO . VOCES FORAM HOSPEDES EXCELENTES . ZELARAM POR MINHA PROPRIEDADE COMO NINGUEM. 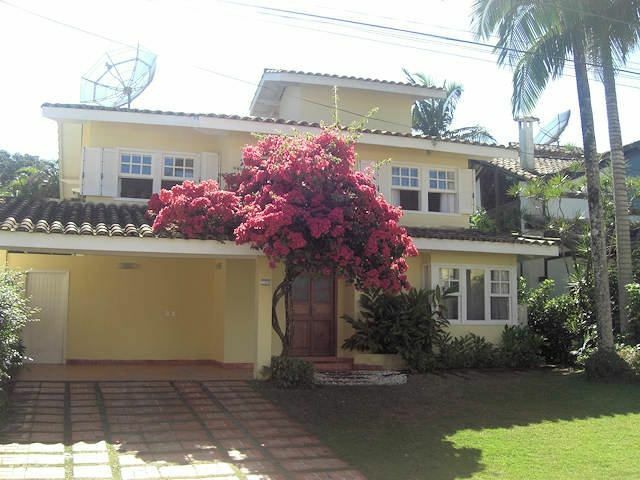 Now that you interou the house, the best of all: Very close to the beach and shopping. Enjoy the walk!